Did the Lord Jesus teach his followers to “bind” the powers of darkness? Should the emphasis on spiritual warfare be on prayer-infused power encounters? What exactly does the Bible teach on the nature of spiritual warfare? Well, according to Christian apologist Greg Koukl of Stand to Reason (STR), the Bible has a lot to say about how we are to defend ourselves against other worldly forces in the unseen realm. We must be armed to the teeth! What does a Christian’s armor look like? “The very first step in arming ourselves for battle against the devil is to gird our loins with truth (Eph. 6:14).” In this piece from STR’s Solid Ground magazine, Koukl tells us what the Bible teaches about the armor of God. Some who read this will be surprised by his teaching for the reason that the way in which charismatics go about dealing with the demonic is highly unbiblical, only they don’t know it. To make matters worse, attempting to “bind Satan” is a ridiculous and foolish practice. Taking on powerful, lying, deceptive demons is dangerous! Sometimes, if you know what to look for, you can “see” something that is invisible; you can see the unseen. It’s not a parlor trick, but a valuable spiritual skill. And it’s not that difficult if you know what clues to look for. I’d like to show you what those clues are. First, though, a foundational matter. I am convinced that most Christians do not understand spiritual warfare. Either they are unaware of the unseen battle or, if they do recognize its importance, they do not focus on the central issue but instead are distracted by a secondary concern. In military terms, they have been taken in by a feint. Here is the feint. Some Christians think of spiritual battle in terms of power encounters with the devil (or demons) where prayer of a certain sort is the principal weapon employed to defeat, or at least to neutralize (“bind”), the powers of darkness. Curiously, Jesus never taught this approach. He never told us to pray to devils. Instead, He taught us to ask the Father to “deliver us from the evil one” (Matt. 6:13). I certainly do not mean to minimize the importance of prayer in any area of our Christian lives, especially this one, but to invite you to see something you might not have noticed. When it comes to spiritual warfare, the New Testament emphasis is not on prayer-infused power encounters, but on something completely different, and if we miss that, then I think we miss the heart of it. We live in a world made by an invisible Being and this world is thick with invisible things. They are all “around us,” in a sense, but not immediately obvious to many since the visible realm is so much more imposing. Elisha, though, was not shaken. He saw a deeper reality in the unseen realm. Elisha saw something his servant did not see: the enemies of God surrounding the city were themselves surrounded by a massive invisible force arrayed behind the scenes for Elisha’s protection. The prophet was able to see the unseen. Of course, there was no non-miraculous way for Elisha’s servant to see into that realm. He needed help. In our case, though, there are passages in the New Testament that tip us off, giving us clues to help us detect details of a world Elijah had access to. There is an invisible army arrayed against us, too, and sometimes—if we are alert—we can track its maneuvers. In this text, Paul tells us we are at war. He acknowledges the reality of opposition in the visible world (“flesh and blood”), but instructs us that the more fundamental conflict is at a deeper level in the invisible realm (“the heavenly places”). This you already know. Here is what you may not have seen before. Paul also tips us off that the enemy operates according to specific strategies he calls “schemes”—battle plans, of sorts, that inform the devil’s tactical maneuvers. Being clothed with the proper armor allows us to “stand firm” against his schemes, resisting the devil’s subterfuge. Can we know anything about those schemes? I think we can. I want you to consider a quartet of verses that add up to a sobering truth alerting us to the principal way Satan advances his army in the spiritual battle. It may not have occurred to you how complete the enemy’s penetration into the minds of men has been, but these passages make it unmistakable. According to the New Testament the entire world is in the devil’s deathly grip. He holds people captive to do his bidding by trickery and deceit, blinding the minds of those who are perishing, keeping them from coming to their senses and seeing the world the way it really is. Jesus warned that the devil “is a liar and the father of lies” (Jn. 8:44), employing ruses even Christians are vulnerable to. When we come to Christ we have a new spirit, true enough, but our minds are still filled with Satan’s foolishness, the lies we readily believed that “deceived” and “enslaved” us (Titus 3:3), as we walked “according to the course of this world, according to the prince of the power of the air” (Eph. 2:2). A key element of our own rescue, then, is reversing the process. We are to “lay aside the old self, which is being corrupted in accordance with the lusts of deceit,” and “be renewed in the spirit of your mind, and put on the new self which…has been created in righteousness and holiness of the truth. Therefore, laying aside falsehood, speak truth each one of you with his neighbor…” (Eph. 4:22-25). Do you see the emphasis? Not surprisingly, then, the very first step in arming ourselves for battle against the devil is to gird our loins with truth (Eph. 6:14). And when we engage the battle with God’s “weapons of warfare [that] are not of the flesh, but divinely powerful for the destruction of fortresses,” we attack those lies and lay waste to them, “destroying speculations and every lofty thing raised up against the knowledge of God…” (2 Cor. 10:3-5). [The devil] gains ground by craftiness and secrecy, and he destroys by lies, accusation, enticement, and subterfuge. If you doubt him, beware. Stealth is his weapon. Satan happily stays in the shadows where he can do his dark business undetected. The principal weapon at the enemy’s disposal allowing him to gain ground in the spiritual conflict, then, is not power but deception. 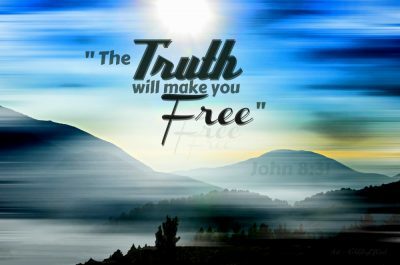 Thus, if the basic strategy for Satan’s spiritual assault is spreading lies, then the most potent weapon we can wield in the battle against him is its opposite: spreading truth. The counter to lies—the answer to deception, the antidote to deceit—is truth. I conclude, then, that spiritual warfare is much more about truth encounters than it is about power encounters.